Michigan Alliance for Lead Safe Homes: Record Breaking 8th Annual Lead-Education Day! Record Breaking 8th Annual Lead-Education Day! Our annual lead education day at the Michigan State Capitol was a record-breaking success! Over 100 participants traveled from all over the state to gather and rally support from our legislators to end lead poisoning in Michigan. This event is annually coordinated by MIALSH and our allies at Michigan Environmental Council (MEC) and we are proud to share that this year's efforts far exceeded our expectations. 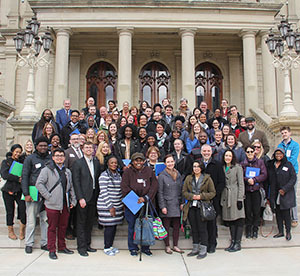 The day unfolded as 18 teams of 3-5 advocates took the State Capitol by storm as we met with nearly 90 state legislative offices in attempts to inform and promote more effective lead laws in Michigan. To supplement our efforts beyond the 90 sit-down conversations with lawmakers and their staff members, we diligently delivered to all 38 State Senate and 110 State House offices a comprehensive packet of thoughtful material summarizing the latest science on lead poisoning and prevention strategies. Lead Education Day participants represented many disciplines and walks of life- justice and environmental health advocates, state and local public officials, lead testing and abatement professionals, parents and even children. We purposely crafted each team to include a parent who could share a personal story of their experience and devastation with lead poisoning in their homes & communities. Special thanks are needed to be given to one of our top MIALASH partners-Healthy Homes Coalition of West Michigan- and the Grand Rapids parents who networked through many channels to assemble a busload of participants for the event. Their efforts and attendance gave Lead Education Day 2018 a powerful West Michigan voice that certainly made a difference. It must be noted that the most impressive and robust element of this event was the teamwork that fueled it. Reynolds displayed admirable organizational force along with several MIALSH members and MEC staff whos major contributions to logistics and preparation made Lead Education Day 2018 a remarkable success. As an intern for MEC and first-time Lead Ed Day participant, I can say that it was exhilarating to see such a diverse group of people band together to fight for a common cause and I felt empowered as I stood in the offices of my state representatives with a head full of knowledge and a heart full of hope. Days prior to the event I had become exhausted with the horrific stories of lead-poisoning and this feeling fueled my desire to make a difference. Lead Education Day is an impactful and meaningful form of community engagement and we believe its influence will ripple through the Capitol and bring forth long-lasting, positive change for Michigan. Cheers to teamwork!